Napoli started the match very strong and the opening-goal of Higuain was not a surprise. 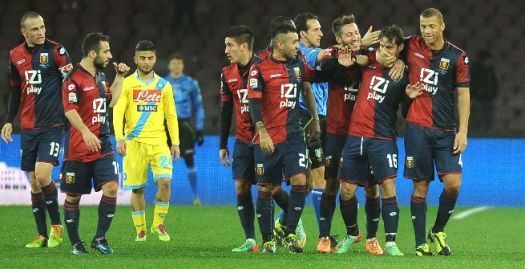 The team of Benitez forgot to score 2-0 and gave Genoa the chance to return in the match. At the last part of the first half Konaté already missed 2 chances and our Senegalese striker also missed a chance just after the break. After also Sculli missed a great chance we got a free-kick in the 84th minute after a hard foul of Mertens against substitute Centurion. Another substitute of Mr. Gasperini striker Emanuele Calaiò placed the free-kick high in the far corner: 1-1. Of course Napoli tried to change the score in the last minutes, but Mattia Perin and his defense did not gave any chance to the Napoli-strikers. A deserved draw: 1-1. Sunday we play in Marassi against number 19 Catania, a victory means another step to the 8th consecutive year in Serie A. What a great match! Genoa was down by 0-2 after 2 sharp counter-attacks by Udinese, but in injurytime of the first half Moussa Konaté headed his first goal in Serie A: 1-2 at halftime. In the opening-minutes of the second half Udinese got a free-kick in midfield. The ball was passed into the penalty-area in which everybody holds everybody just as with every corner in Serie A. Not to referee Tagliavento who punished Burdisso with a yellow card and a penalty to Udinese which was realized by Muriel: 1-3. Mr. Gasperini protested against the penalty and was send away, but just before he brought Fetfatzidis in the field which was the key to return in the match. A great dribble of our Greek Messi brought the ball with Gilardino who scored from just outside the penalty-area: 2-3. Ten minutes later a corner of Genoa finally ended in the goal by Gilardino after the shots of Calaio and De Maio were blocked: 3-3. In the last 10 minutes both teams tried to score the winning goal, but this match did not deserve a looser: 3-3. We now have 31 points in the standings. 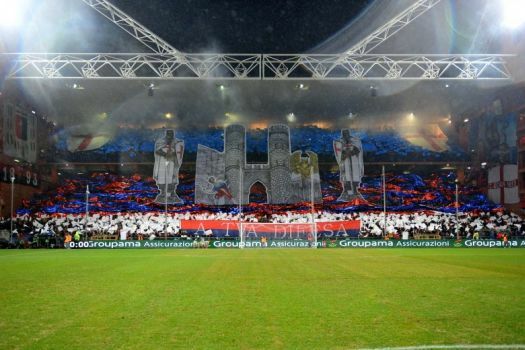 Since 1938 Genoa did not win in Livorno. Of course we don’t play every season against the Granata of Toscany, but 75 years is too long. After the bad match against Sampdoria the Gasp-boys had to take revanche. With Captain Portanova back in the team there was surely more spirit. Already in the 9th minute “our” Luca Antonelli scored the only goal in the rebound after goalkeeper Bardi stopped a shot of Gilardino. 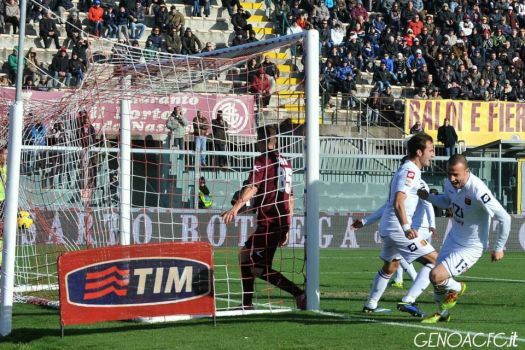 Genoa refused to score the deciding second goal so in the last minutes Livorno tried to score the equalizer. In the 94th minute Livorno was close to score but Portnavo headed it out of our goal. A nice victory that gives us already 30 points in the standings, 1 point above A.C. Milan. 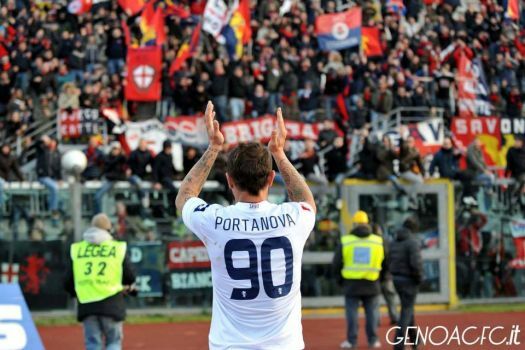 Portanova celebrated it with the 500 fans that travelled to Toscany. 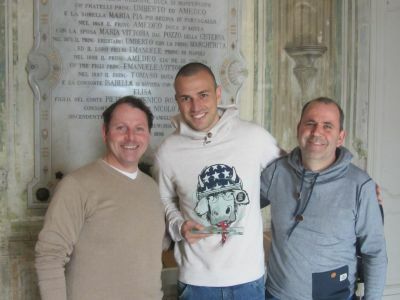 After the news in October in the Italian newspapers and on several websites that Luca Antonelli is our Genoano of the season 2012/2013 we hoped that Luca wouldn’t be transfered to Napoli before we could handover the trophy. Happily Rafael Benitez don’t know Luca Antonelli very good yet, so our left midfield-player who reached the Italian National team and hopes to go to Brazil this summer could receive his trophy. Very friendly Luca was very happy with his trophy and thanked all his fans in Holland and Belgium for it. As a surprise Luca also told us that he will sign a new contract with Genoa till 2018, so we don’t have to be afraid that he leaves us. He hopes to receive our trophy also the next years and to be the new Marco Rossi of Genoa! After the handover of the trophy we were guests at the weekly press-talk of mr. Gasperini. Gasp told that he was afraid that Sampdoria would be more passioned the next day because they lost the first derby. he also missed some “grinta” by our players. Unfortunately Gasp was right as we now know. 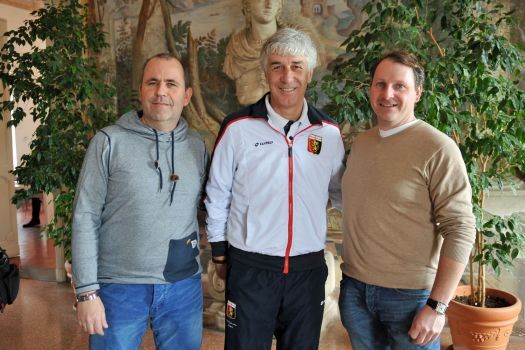 After the press-conference Gasperini wanted to make a foto with us in front of Julius Cesar. After the fantastic matches against Inter and Fiorentina mr. Gasperini was afraid that the team was satisfied and less motivated as Sampdoria that lost the first derby this season by 0-3 and surely want to have revanche. After the choreography that was surely won by Genoa (see foto’s) indeed it was the team of Mihajlovic that started more aggressive. In the 25th minute it was Maxi Lopez who scored the opening-goal after a combination with Eder in the heart of our defense. In the 2nd half with Fetfatzidis in the team Sampdoria only defended their advantage. Genoa had several chances, but missed a little bit of luck and some extra passion to score the equalizer. A draw would surely be the right result, but if you start a match to easy you often lose it.